Football magazine FourFourTwo has predicted Brighton will be relegated from the Premier League this coming season. The Seagulls finished 15th in their debut Premier League campaign last year but FourFourTwo tips the club to go down with newly-promoted Cardiff and Huddersfield this season. The magazine said: "Fail to improve their away form in a big way, and it will be a long old season." Albion fan Scott McCarthy, asked by FourFourTwo about the 2018/19 season, feels the club will finish 15th again but closer to the relegation zone than last year's seven-point gap. FourFourTwo say Pascal Gross will be Albion's key player, after being involved in 44 per cent of the club's goals last season. 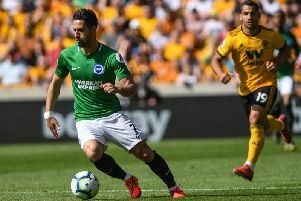 The preview appears to have been written before Brighton signed Mali international midfielder Yves Bissouma and Iran winger Alireza Jahanbakhsh, who joined last week for a club record fee. Manchester City are predicted to win the Premier League, ahead of Liverpool, Manchester United and Tottenham. The full predicted table is: Manchester City, Liverpool, Manchester United, Tottenham, Chelsea, Arsenal, Leicester, Everton, West Ham, Wolves, Crystal Palace, Burnley, Newcastle, Fulham, Southampton, Bournemouth, Watford, Brighton, Huddersfield, Cardiff.